The First Step in making the Best Coffee is using a French Press — The Right Water. Sing tap water will handicap your flavor. You must use filtered or spring water. And, distilled water won’t work either — you need minerals to aid in the extraction process. So, only use cold filtered, or spring water. That’s the first step to make the best coffee for using a french press. Yes, the coffee beans make a difference in your cup of coffee. You need the best coffee in the world that is BAWK’s 100% Jamaica Blue Mountain® Coffee. Of course this means you need certified organic, shade-grown and freshly roasted coffee. But how do you grind it? Coarse! The beans must be ground coarse to prevent the sludgy post-brew grounds from ending in your cup. You need 2 tablespoons per 6 ounces. That’s the second step to make the best Jamaica Blue Mountain® Coffee for using a french press. You need a good filter. The best filter will keep the coffee grounds in the press — not in your cup. BAWK Coffee recommends Bodum. Bodum makes some of the best french presses. Their filters come in three pieces that you can take apart and clean. That’s the third step in making the best coffee for using a french press. Fourth Step – Don’t Boil The Water. Never pour boiling water on your freshly ground beans. Boiling water will scorch the beans and alter the taste. You need hot water that is just off of the boil. The ideal temperature is between 195 and 205༠F. That’s the fourth step in making the best coffee for using a french press. Fifth Step – Bust the Crust! Once you have doused all of the grounds in water wait for the “crust” to form. The “crust” is the grounds that will rise to the top. To aid in the extraction process you must stir the grounds and break up this “crust.” If you have a glass french press, only stir using a wooden stirrer or chop stick. Over time a metal stirrer or spoon can cause the glass to crack and break due to the high temperature of the water. That’s the fifth step in making the best coffee for using a french press. Sixth Step – Let It Sit! Let your coffee sit for 3 to 5 minutes — depending on how strong you want your brew. Then, finally, press and pour. That’s the sixth step in making the best coffee for using a french press. Seventh Step – Enjoy it!!! The dark brew falls, splashing and swirling till it comes to its resting place — in your warm mug. Warm your mug prior to pouring to maintain the heat and flavor of your coffee. Lastly drink your beautiful 100% Jamaica Blue Mountain® Coffee in your french press coffee within 10 minutes of pouring. The flavors of the coffee will change as the temperature cools. This provides you with the widest range of flavors. That’s the seventh step in making the best coffee for using a french press. 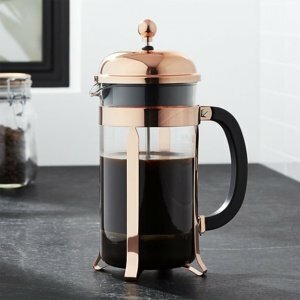 So there you have it — The 7 tips to make the best 100% Jamaica Blue Mountain® Coffee when using a french press. The best coffee extraction method — French Press, running the length and breadth of Coffee’s vast variety of flavors.